Полированный алюминий является лейтмотивом всей программы Genesis. 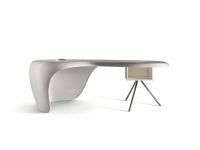 WRITING DESKS:Genesis desks are characterized by their elegant and unique leg design, in perfect tune with tops in the following finishes: oak wood (wengé dyed or natural), glass (transparent or red) and leather (in the main colours moka or cream). The independent desk legs are sturdy, shiny aluminium castings, each with three support points for the top to ensure perfect stability of all desk versions. 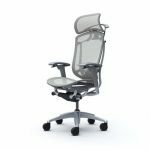 Legs can also feature a vertical trim in carbon fibre for a high-tech look, or in saddle-stitched leather, giving the desks a more elegant and sophisticated appearance. The three versions of top available are wood, glass and leather. In the wood version, made of 30mm veneered MDF (medium density fibreboard), the top is chamfered round the edges, veneered with natural or wengé dyed oak and finished with several coats of opaque polyurethane varnish. The desk top is enhanced by a slim, shiny aluminium narrow band that runs across it lengthways.In the leather version, the MDF top is covered with saddle-stitched leather and finished at the corners with shiny aluminium corner caps. 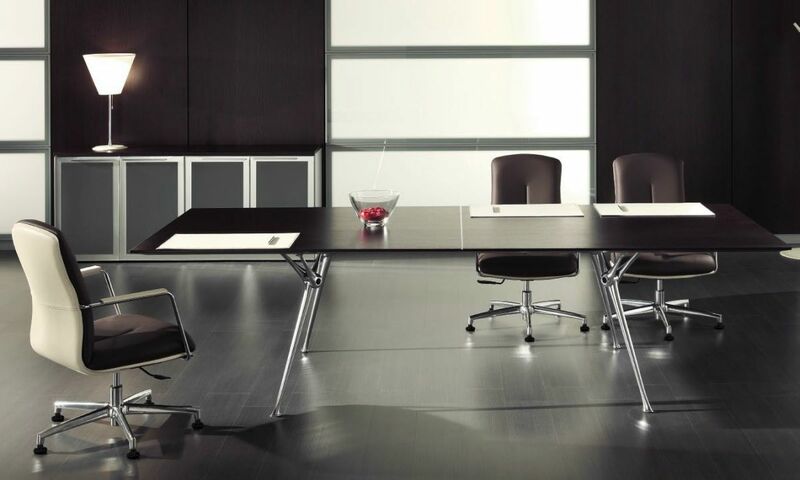 In this case too, a slim, shiny aluminium narrow band runs along the entire length of the desk.In the 12 mm tempered glass version - transparent or lacquered in an exclusive claret red colour - the top is finished with a straight, polished edges all round.All the three versions of top can be combined with a multilayer modesty panel veneered in natural or wengé dyed oak, with a finishing strip at the bottom in chromium plated steel.As an option, the desk can be fitted with an elegant leather cable tray: fixed transversally across the legs, it has an adjustable steel rod that runs through it to control the flexibility of the cable casing. A leather sheath can also be fitted down the leg, through which the cables can be fed upwards. Another version allows two of the legs to be replaced with a structural bridge extension, 40 mm thick, in veneered wood, with the top attached at 45° and with sides featuring a chromium plated steel finishing strip.